More stripes, more Papercut Ooh La Leggings and one of the few Grainline Studio Lark Tees I made lately. While down under spring has officially begun, up here in the northern hemisphere autumn just started to quietly creep in, with its random storms and cooler nights. And while I’d love to sew many more summer dresses, I’ve decided to be sensible and started making season-appropriate clothes instead. This is my second version of the Ooh La Leggings. I’ve worn to death my first pair, made out of some marl gray Ponte de Roma, and as soon as I saw this black fabric I knew what I wanted to do with it. It’s a sort of scuba knit, with a geometric/ethnic pattern all over and not very stretchy, but still with enough give to make a comfy pair of leggings. As for my first OLL, I’ve cut a S and made no mods. I’ve serged the pieces together and then top-stitched them with the sewing machine. This time I’ve secured down the whole central front leg seams and I hope the stitches aren’t going to pop, I’m a bit worried for the lack of the proper amount of stretch. For the hem and the elastic waist I’ve used the coverstitch machine we got at work, it really gives a nicer finish than a regular twin needle. I like the fit of these leggings, not sure how flattering is the fabric tho, maybe a bit too shiny and leather-looking, but whatever, I know I’ll wear them heaps this winter. This is Lark Tee number 3/4, the first one was made out an awesome striped cotton jersey I got in Melbourne, but the fit was horrendous so I gift it to one of my friends. Eventually I’ll post them all to show you the improvements. For this one, I’ve cut a size 8 and made a few adjustments to get here: 3/4″ broad shoulders – which sounds massive! – 1/2″ forward shoulders and shortened the body by 1 1/2″. I’m quite happy with the fit for now, but I can see there are still some problems in the shoulders area. Sooner or later I’ll understand what to change to reach those fit-perfection heights! 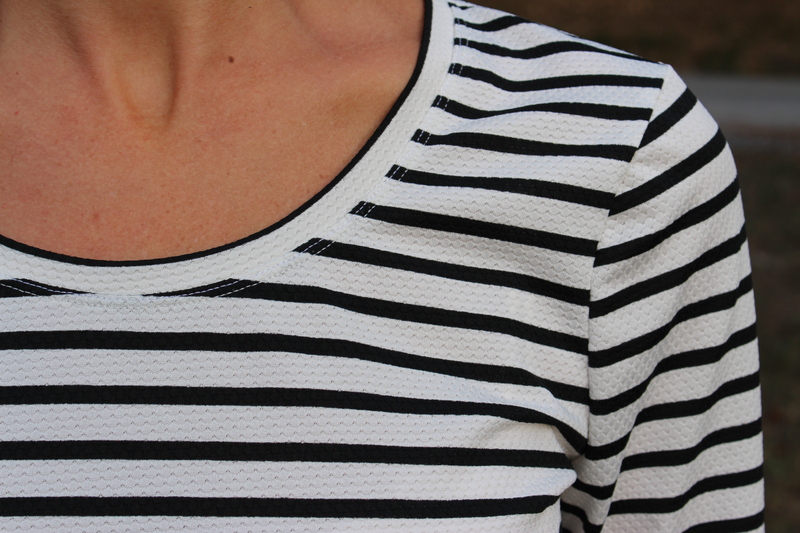 The fabric is a cheap polyester market find, but I love the little texture and the stripes of course, on top of that, being black and off white makes it very versatile and it’s always on high rotation in my wardrobe since I made the t-shirt. I’m not ready for the moodiness of autumn and winter, but sewing helps me going throw a lot lately and I’m grateful for having decided to learn. Hope everyone is having an awesome weekend! Lovely classic tshirt and the leggings look great! I’ve got the Lark printed and just need some time (now that I’ve finished the tutu) to try the pattern out! Thanks lizzy! I really like the Lark Tee, can’t wait to see yours! Great outfit! This looks suuuuper wearable. I love it! The leggings look great and the fabric is so lovely! The t-shirt is such a great staple. Very well made!